Right: Library speaker Jerry Leitner discusses the gospel of Mary Magdala, a Common Ground program, in October. Due to its size, the group gathered in James Parlor, on the second floor of 77 W. Washington St. for this program. BOOK GROUP DISCUSSION: Michelle Obama's "Becoming"
Join us for a discussion of Michelle Obama's autobiography covering her early years growing up and working in Chicago. Copies of the book are available on loan from the Swedenborg Library. Fee: None. Free-will offering for refreshments. Since the 1920s, Edward de Vere has been proposed as the true author of the plays we attribute to William Shakespeare. 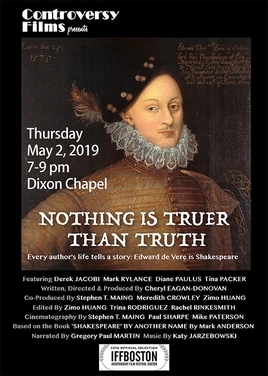 The film Nothing is Truer than Truth introduces de Vere, the Seventeenth Earl of Oxford, an A-list party boy on the continental circuit, who traveled to Venice and throughout Italy in 1575-76, discovered commedia dell'arte, and collected the experiences and characters that are embodied in the works of Shakespeare. Filmed in Venice, Verona, Mantua, Padua, and Brenta, Italy, at sites visited by De Vere and the settings for The Merchant of Venice, Othello, Romeo and Juliet, and Two Gentlemen of Verona, the film features award-winning actors and directors Sir Derek Jacobi, Mark Rylance, Diane Paulus, and Tina Packer. The film is directed by Cheryl Eagan-Donovan. Fee: $5. RSVP to Info@SwedLib.org to reserve your seat. Limited to the first 50 attendees. Controversy Films presents media projects that challenge conventional wisdom. The company’s films ask difficult questions and incite dialogue and action. 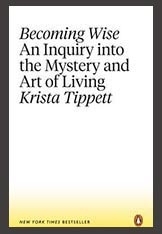 In Becoming Wise, Krista Tippett has created a master class in living for a fractured world. Fracture, she says, is not the whole story of our time. The enduring question of what it means to be human has become inextricable from the challenge of who we are to one another. She insists on the possibility of personal depth and common life for this century, nurtured by science and “spiritual technologies,” with civility and love as muscular public practice. And, accompanied by a cross-disciplinary dream team of a teaching faculty, she shows us how. Copies are available on loan from the Swedenborg Library. 77 W Washington St., Chicago. Fee: None. Freewill offering accepted. Rev. 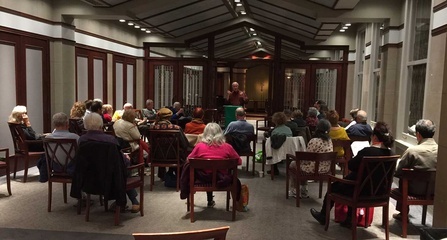 Matthew Fox on "The Lotus & The Rose: Meister Eckhart, Tibetan Buddhism and Other Mystical Connections Between East & West Today." Author Matthew Fox is a distinguished theologian, scholar, and activist who was silenced by the Catholic Church for his progressive and inclusive beliefs. Co-author Lama Tsomo is an American-born secular Jew who once embraced Tibetan Buddhism as a student, and now is embraced as a teacher. Buddhists, Christians, followers of other spiritual traditions, and even those with no formal spiritual tradition at all will be intrigued by the range of ideas, and impressed and enlightened by the knowledge and experience that Matthew and Lama Tsomo brought to their exchanges in this volume. Join Matthew Fox on Saturday, June 29 for an exploration of the mystical connections between Eastern and Western traditions, followed by Q&A. The location for this program will be announced shortly. Open Wednesdays & Fridays, 1pm-5 pm, and before/after public programs.